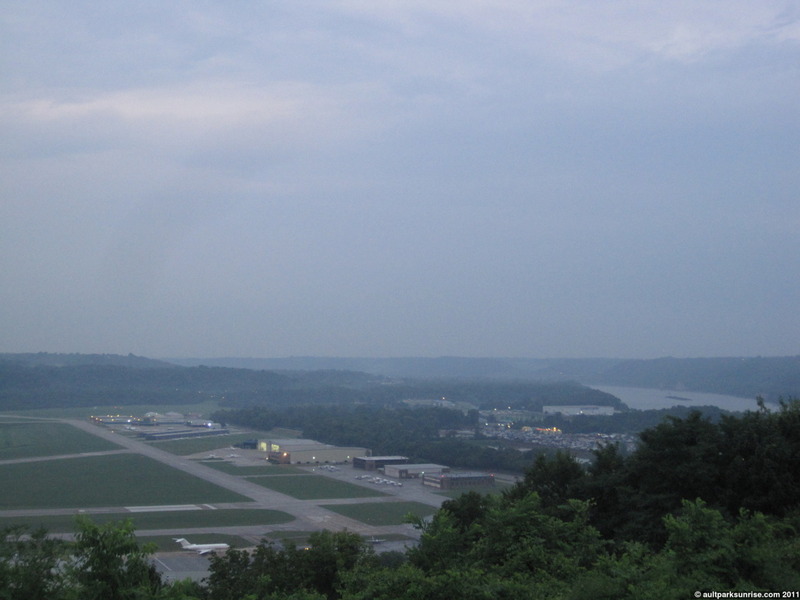 A barge floats down the Ohio River in the background, to the south west of Lunken Airfield. A front moved into the area sometime last night. The sunset was clear and deep pink so I had hoped for a great sunrise this morning. What I ended up getting was a wet and misty morning in Alms Park (history). I didn’t get rained on, but about a half hour after I got home the rain front opened up and dumped down on Cincinnati. I have great expectations for tomorrow’s sunrise! A note for future self: Albert D. Taylor designed the park. I found a book called “The Complete Garden” which I believe is from the early 1900s. I’m guessing the author is the same Albert D. Taylor that designed Alms Park. This has been a strange week for me. It was the first time I missed two weekday sunrises in a row. It is also the first time I’ve been to a Monday night music show. I got a last minute call from a friend who was coming in from out of town to see a show at the 20th Century Theater in Oakley. The history of that building dates back to 1941. It was also my first time going to a true EDM (Electronic Dance Music) show. We saw The Glitch Mob in the 70 year old venue on Madison Ave. Actually now that I look at the history page, it turns out we saw the show on August 01 2011, 70 years after the grand opening of the theater on August 01 1941. That’s pretty neat. I hadn’t heard of The Glitch Mob before and so I played catch up with their music. It actually was a perfect example of where the state of the music industry for small groups like The Glitch Mob is. I bought their EP for $2.95, with the option of getting the EP with a vinyl along with it for $15 (which is an incredibly tempting deal). Not even a CD option on their website! Although you can purchase them at the show. I can also listen to any of their songs in HD on YouTube. It is interesting to look at this in contrast to what was possible even 10 years ago. It was an excellent show and the crowd was great. In the end, however, it was a late night and I didn’t make it up for the Tuesday morning sunrise. I spent all day in the sun on Sunday, so Monday morning was actually spent sleeping through my sunrise alarm. Whoops! 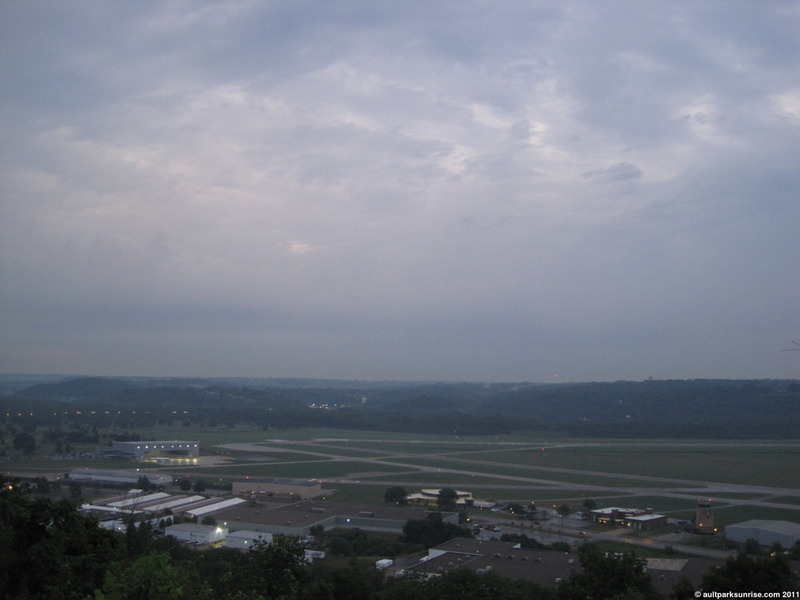 This entry was posted on August 3, 2011 by Ault Park Sunrise. It was filed under alms park, overcast and was tagged with 20th century theater, alms park, cincinnati.